Sweet potatoes can be found in nearly every grocery store, and are a common ingredient in American cuisine. However, many people don’t realize that sweet potato greens are an edible, tasty treat that can be prepared like any leafy greens–steamed, boiled, or sauteed with olive oil and garlic. In fact, sweet potato greens have been a staple in West African and Asian cuisine throughout history. 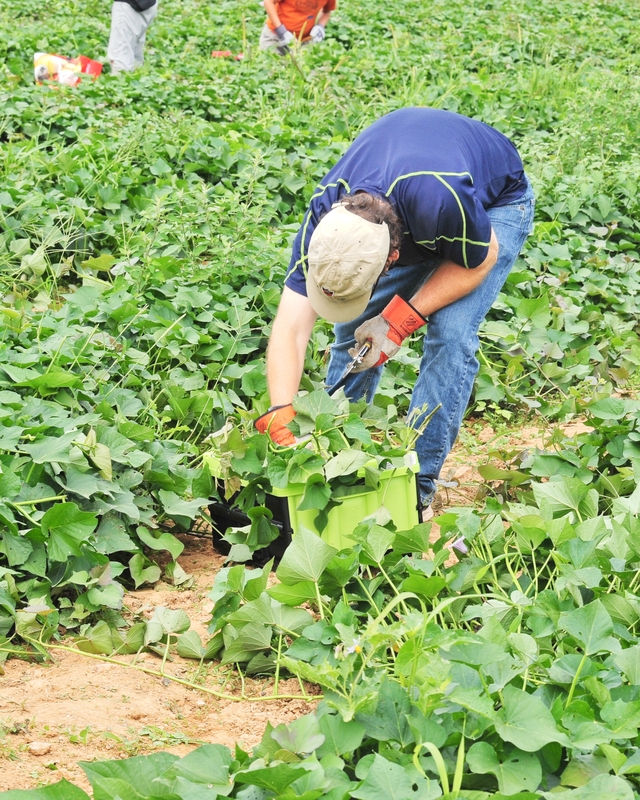 Most local food-producing farms tend not to harvest this part of the plant because of the lack of demand. But Red Wiggler Farm is not like most farms. 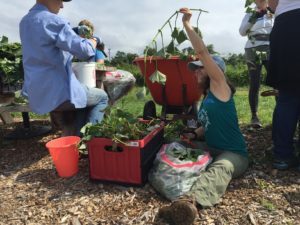 Red Wiggler Community Farm was founded in 1996, as a sustainable farm where community members come together to work, learn, and grow healthy food. 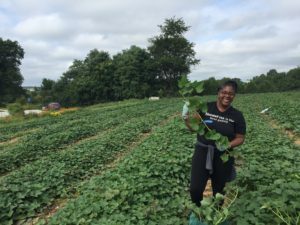 The farm aims to address several issues at once: the lack of job opportunities for adults with developmental disabilities, a lack of nutrition education and food security amongst the disabled population, and food insecurity more generally in Montgomery County. The vegetables grown at Red Wiggler are sold to members of their Community Supported Agriculture (CSA) program or donated to food assistance providers throughout the county. On August 20th, the Food Council, led by our Environmental Impact Working Group, and along with members of the Montgomery County Master Gardener’s Association and Community Food Rescue, had the opportunity to visit Red Wiggler Community Farm, meet several of the staff members and volunteers, and glean sweet potato greens to donate to Shepherd’s Table in Silver Spring. Our group spent the morning in the sweet potato fields, clipping the greens, and then stripping them from the vines. Our collective efforts yielded nearly 50 pounds of greens! We were assisted by the Red Wiggler Farm Co-Manager, Melissa McLearen, and longtime grower, Jerry Dillon. 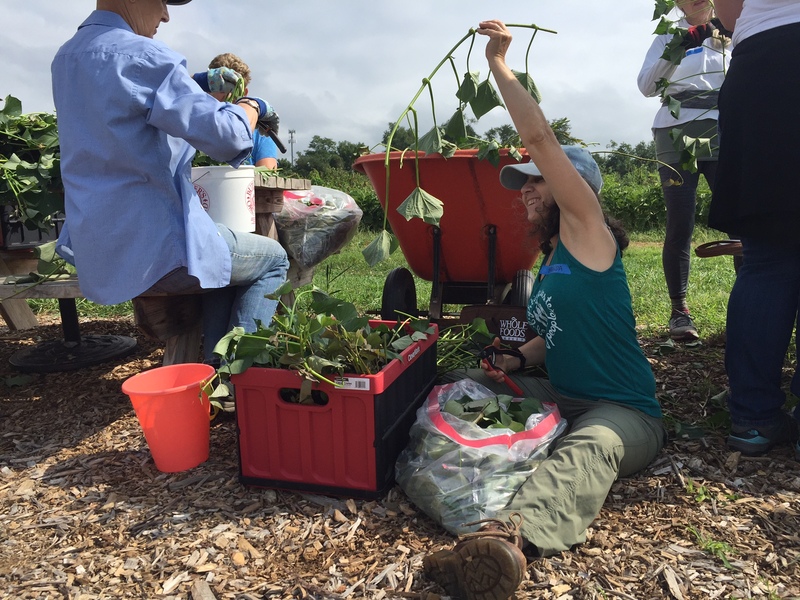 Following our gleaning session, we gathered with Red Wiggler staff and volunteers for lunch, where we discussed the topics of food waste, food insecurity, and on-farm composting in Montgomery County. 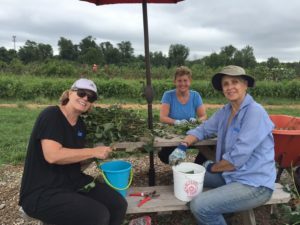 Our day culminated in a tour of the farm, during which we made stops at the pick-your-own flower fields, the impressive compost pile, and the honey bee hives. The Food Council would like to thank Red Wiggler for hosting our group and sharing our dedication to reducing food waste in Montgomery County. 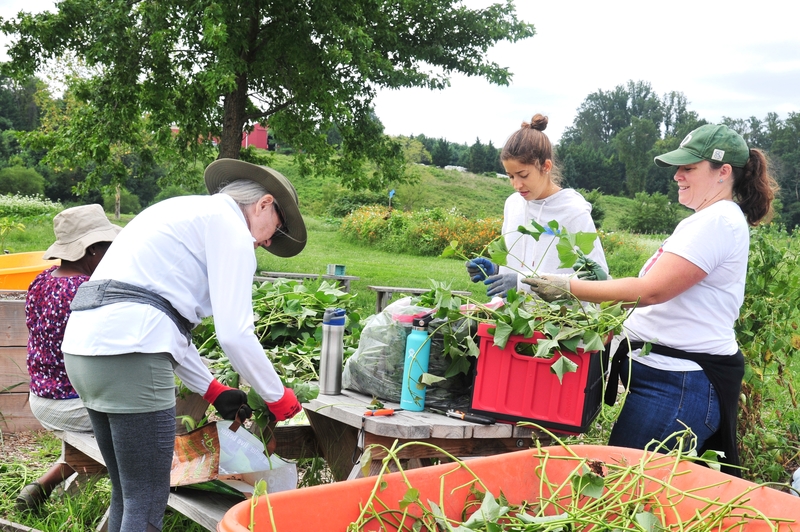 Learn more about Red Wiggler Community Farm on their website, and find them in the 2018-2019 Montgomery County Food and Beverage Guide, coming soon!